← Is Carbonated Water Bad for the Teeth? Who was Tiberius Julius Aquila Celsus Polemaeanus? The Library of Celsus was built in honor of Tiberius Julius Celsus Polemaeanus (Τιβέριος Ιούλιος Κέλσος Πολεμαιανός), a wealthy Greek from (probably) Sardis. He was later granted Roman citizenship. The inscription on the façade of the library (which I do not remember seeing) gives his full name, stating that his son, Gaius Julius Aquila, built the library; Tiberius Claudius Aristion was executor of the will. There were two other inscriptions (one in Greek, the other in Latin) located on the “cheeks” of the stair banisters (which bore equestrian statues of Celsus); these stairs are not accessible to the public. Celsus’ father was a Roman knight and rather wealthy. In 68, Celsus read the law and started his military career as a Roman tribune in Alexandria. 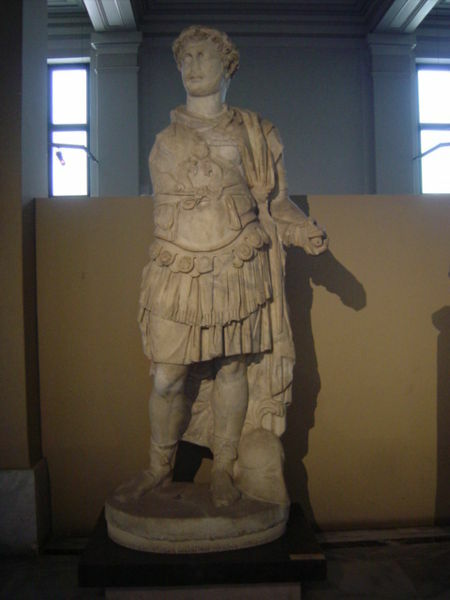 The legion in which Celsus served was the one that later proclaimed Vespasian emperor in 69. As a reward for his support, Vespasian made Celsus a senator in 70. From there, Celsus then became an aedile. In the mid-70s he was a praetor, a supreme judge in Rome. From 78-85 he was in Cappadocia as legatus iuridicus, then became a Roman legion commander in Syria, then the governor of Bithynia and Pontus. From 85/87 Celsus was in charge of the pension funds for veterans in Rome, and then from 89-91 he was a legate in Cilicia. Emperor Domitian made him a consul suffectus in Rome in 92 as a reward for all his years of faithful service. After this, he was elected to the college of priests, the quindecimviri sacris faciundis. He served as curator aedium sacrarum et operum locorumque publicorum populi Romani in Rome. This office oversaw finances and organization of imperial building projects in the capital, which were huge during the reigns of Domitian (81-96) and Trajan (Cr. 98-117). In 105/6, Celsus became the proconsul (governor) of the rich province of Asia , with the seat in Ephesus. He must have stayed in Ephesus; he died there before 114. His son, Tiberius Julius Aquila, continued the library project as a burial gift for his famous father, but he died before it was completed. We also know about Aquila, who was born 70-75. He had been suffect consul in Rome in 110 after an unknown career. Aquila was able to tap into the contacts his father made with the architects and building guilds as aedium sacrarum. Aquila hired them for his Ephesian project. There are similarities between the decorations on the Celsus library (construction began around 113/4) and on the forums of Trajan and the reconstructed Caesar; such decorations were unknown in Asia Minor up until that time. To bury anyone inside city walls was unusual, only done for those who served their city. It was forbidden to build mausoleums inside the city, so by burying Celsus in his library crypt showed how rich and honored he was by the citizens of Ephesus. No one is quite sure how he favored Ephesus while living there. Stroka, Volke Michael. “The Celsus Library in Ephesus.” In Ancient Libraries in Anatolia: Libraries of Hattusha, Pergamon, Ephesus, Nysa ([Ankara]: Middle East Technical University, 2003), p. 33-43).